Strats you can take to the ladder. 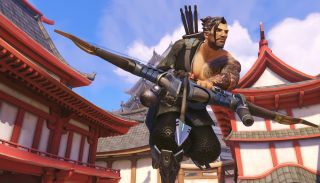 The North American Open Qualifier for Overwatch Contenders took place last weekend, with hundreds of professional and amateur teams fighting it out in Blizzard’s “developmental league”. With $50,000 on the line and Overwatch League glory in their sights, players from all over the region put on quite the show for tens of thousands of Twitch viewers in this online showcase. There weren’t many surprises in the end, with Immortals, Renegades, LG Evil, Yikes, Kungarna and Selfless being among the 16 squads advancing to the group stage. Here are a few key plays from some of last weekend’s matches. At the start of this match, Tempo Storm went for a pretty standard high-ground defense on Watchpoint: Gibraltar. It gives you the best vantage point of the payload and its surrounding area, and, in theory, it should be more difficult for the attacking team to uproot your team. However, as they’re prone to do, Immortals laughed in the face of convention and made quick work of their foes using a standard Winston, D.Va, Tracer and Genji setup with Lucio and Zenyatta for support. We’ve discussed it so many times now, and here’s another example of how a quick, mobile composition is key to success in Overwatch right now. All of the tanks and DPS in this comp are geared toward verticality, and Gibraltar is not shy about its overhangs and high ledges. It should be a no-brainer what Immortals was thinking in this situation, and it paid off with a team wipe. But fear not, ladder warriors. Reinhardt is still a viable pick here, you just need to make sure not to let that high ground get comfortable. The new and improved Reaper is an excellent choice for harassment on Gibraltar. One interesting side note about this Immortals lineup is that they benched Aythen and Nomy in favor of two Korean players named Fate and Kariv. Some people had their doubts about the new language barrier Immortals faced, but it didn’t seem to impact their play too much. Facing a typical 2/2/2 comp? Why not substitute a third DPS for a second tank? Sometimes it’s as simple as adding more damage to the equation. Many Korean teams, as well as the French-yet-NA team, Rogue, have been doing this for some time, and it can be devastating. Your best bet is to roll out with a Soldier since his kit is the most well-rounded. What Genji, Tracer and Pharah start, Soldier can finish. Or, you know, there’s always Mei. Her ultimate and walls are major annoyances on every map, and slowed targets are as good as dead. Of the teams that have had an interesting 2017, LG Evil are near the top of that list. Having a flawless start to Carbon Series back in March as the Hammers Esports roster, they would end it in second place as Luminosity Gaming’s second Overwatch squad. They’ve had their struggles since then, especially with Selfless, who they’ll have to overcome in the groups phase of Contenders. Things were looking up for the young team against Kungarna, however, as they took the set 2-0 on June 3rd. Any Winston fans out there? Primal Rage is a tool best used for getting people off of points or away from nasty chokes most of the time. The hanger on Gibraltar is not one of those times. Though the are a couple of chokes along the snaking payload path, you can get in people’s faces and smash them against the walls in that area for some quick kills. As you can see from Super’s amazing play, it’s also possible to jump through the point to get to people in the backline. Take a look at where your team is positioned before trying that on the ladder. If you have a DPS or two up in the rafters, this particular play becomes downright lethal. A quick note about Kungarna: they’re the former Splyce roster before they bowed out of Overwatch, and they’re also the former Ghost Gaming team. Kungarna has a lot of developing talent and an exciting style of play, so let’s see if they don’t get landed by a big team as Overwatch League progresses. If you had told me a month ago that the Overwatch esports scene was healthy, I would have shot you a funny look. As Noah Whinston of Immortals suggested, there wasn’t a lot going on. But when Contenders was announced, the community wiped some of that sweat from its brow. That anyone could form a team and register for the qualifiers was in the spirit of that very first promo we saw at Blizzcon 2016. That known endemic teams advanced to the top 16 parted some of the gloomy clouds that had been lingering over the esports scene for the past few weeks. Things are exciting, and fans and pros alike are engaging with the content. We’re headed in the right direction. As far as presentation goes, Contenders is as top notch as you would expect from Blizzard. The overlay is great, and the picture-in-picture format for instant replays is a beautiful touch. All of the commentators are top of the line, with seasoned talent like Alex “Gillfrost” Gill and Christopher “MonteCristo” Mykles delivering exciting play-by-play analysis and commentary. It’s good to see a proper commentator desk and backdrop at something other than Apex once again. Overwatch Contenders has set something important in motion, and it’s up to Blizzard to nurture that momentum. As Overwatch League approaches and whatever plans they have for MLG come to fruition, we’ll see what Blizzard’s shooter is made of.